Every day we are bombarded with expensive marketing campaigns and emotive advertising slogans promising the perfect skin and body. In truth, finding the best possible treatments for your specific needs is difficult and should only be undertaken by qualified, medical professionals. Whilst they may seem simple, these principles are all too frequently ignored. Situated in Richmond, West London, Bodyvie’s unrivalled reputation has been built on the foundation of Dr Weber’s sterling experience. Qualified in general medicine in 1981, Dr Weber was a founding member of the British Association of Cosmetic Doctors (now the British College of Aesthetic Medicine), and one of the UK’s first accredited physicians offering advanced laser treatments, dermal fillers and wrinkle relaxing injectables. 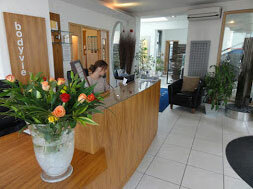 Bodyvie was established in 1999 and at the time was one of the first cosmetic clinics in the UK. Over the last 16 years, as well as acting Lead Doctor and Medical Director of Bodyvie, Dr Weber has worked in some of Harley Street’s best-known clinics and also contributed to the lecture circuit. Dr Weber ensured continued professional development for all the team and only utilises the latest technologies. This wealth of experience within the field of medical aesthetics has allowed Dr Weber to establish himself as one of the UK’s leading specialist cosmetic doctors. With an emphasis on quality and continuity of care, Dr Weber has assembled the finest possible team of doctors and medical aestheticians, ensuring his high standards are reflected throughout the clinic. At the heart of what we do is you. Every patient has a different set of goals, and every patient’s skin is unique. So we will work closely with you, giving you as much information and support as possible, to ensure that you are comfortable with the procedure and thrilled with the outcome.